When it comes to health care, cats are notoriously underrepresented. Although cats are the most popular pet in the United States, they make far fewer trips to the veterinarian than their canine counterparts. Cats also receive less preventive dental care than dogs, both at home and professionally, and this can have a disastrous impact on their health and quality of life. Taking charge of your pet’s health with proper cat dental care can change their future, and The Pet Experts at Naperville Animal Hospital are happy to help! Like humans, cats are susceptible to plaque and tartar buildup on the teeth. If left unchecked, this can lead to inflammation in the gum tissue, which marks the beginning stages of periodontal disease. Receding gums, exposed roots, and abscesses can result. Eventually, damage to the heart, liver, kidneys, and other organs can occur as the disease progresses. Most cats will need a professional dental cleaning and examination, including digital x-rays, once a year (or as indicated by your veterinarian). This allows us to thoroughly examine the mouth, look below the gumline (where dental disease begins), and descale and polish each tooth. Cats are hard wired to hide signs of pain and illness, which makes it difficult to know when your pet is struggling with dental disease. FORLs (feline odontoclastic resorptive lesions) is a painful condition that can result from untreated dental disease and is surprisingly common among feline patients. The lesions begin under the gumline and are initially undetectable. By the time they show up in the form of red and irritated gums, bad breath, and mouth pain, the condition has advanced enough to begin destroying the nearby tooth. Cats with FORLs may eat and behave normally at home. Paying close attention to your cat’s behaviors and food intake and cultivating a good at-home routine is crucial in preventing and treating FORLs. 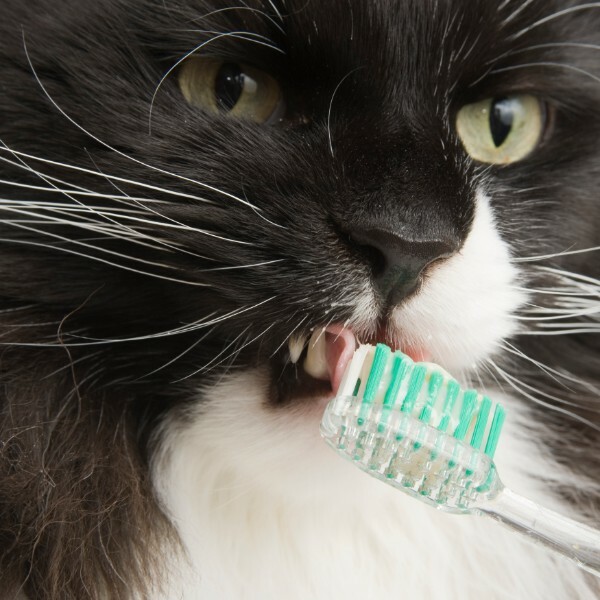 We know you want to provide the best care possible for your feline friend, but the thought of getting anywhere near your cat with a toothbrush might seem preposterous. However, with time and patience, nothing is impossible! Start by allowing your cat to sniff and lick a small amount of cat-specific toothpaste from your fingertip (try flavors like poultry or seafood). After a few days, squeeze some toothpaste on a small feline toothbrush or fingerbrush for your pet to investigate. Gradually place the brush in your cat’s mouth; add in circular brushing motions once your pet seems comfortable. This process can take several weeks or months before your cat accepts tooth brushing, but a clean and healthy mouth is well worth the effort! In addition to brushing on a regular basis, certain products can help keep your cat’s mouth clean in between visits to our hospital. For additional recommendations about cat dental care, please don’t hesitate to contact the team at Naperville Animal Hospital. Take advantage of our current offer as we celebrate Pet Dental Health Month in February with 20% off dental cleanings! Book your appointment now!